This is an easy slaw recipe that comes together fast! 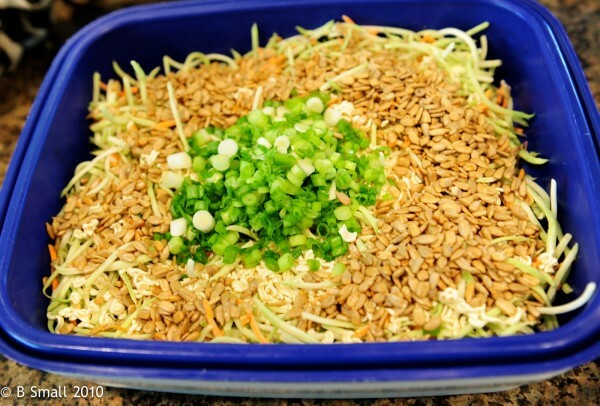 Broccoli slaw, green onions, Ramen Noodles with the seasoning, sunflower seeds, apple cider vinegar and sugar give it a slightly sweet and tangy flavor. 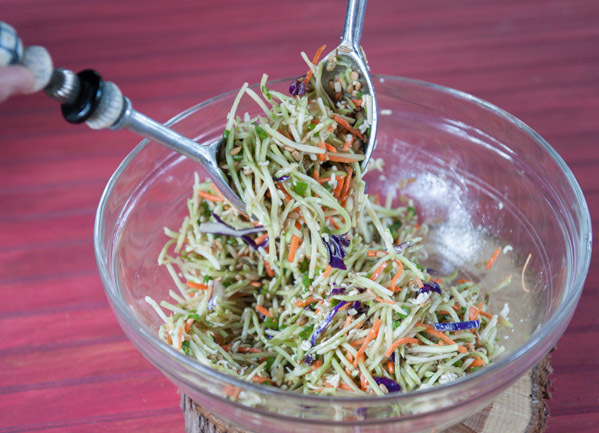 Broccoli slaw, green onions, Ramin Noodles with the seasoning, sunflower seeds, apple cider vinegar and sugar quickly come together for an easy, slightly sweet, but tangy slaw. Something a little different that my family requests on a regular basis. I’m not sure where I found this recipe, but I have been making it at least a couple of times a month for about the last 15 years. Zach, my son, and Joel, my husband, love this slaw and request it often. It is soo yummy served as a side with almost anything cooked on the grill. 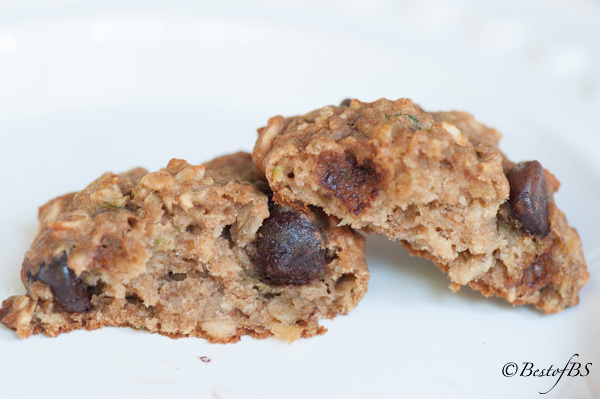 The original recipe was way too sweet and also called for 1 cup of cashews, which I never added, as I thought it would make it a bit too nutty. 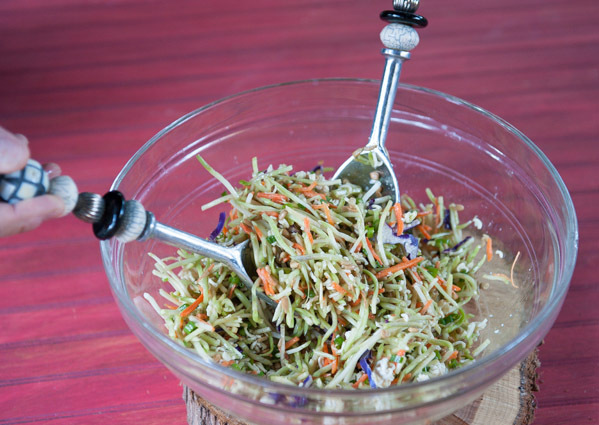 I have lots of requests for this version of Broccoli Slaw. 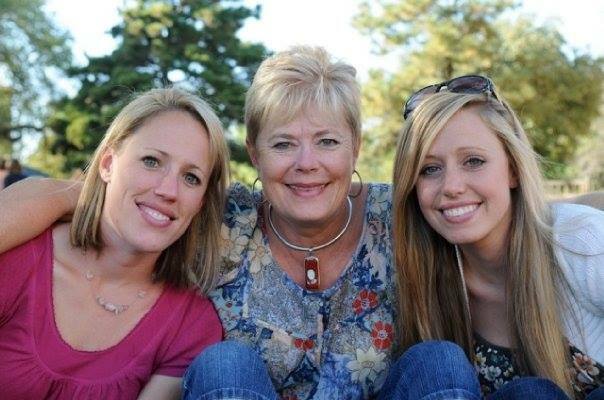 My mother was the only person I know who didn’t like it. I always double the recipe, as the leftovers are great for several days. It is a very easy recipe to double…simply double all of the ingredients. Now, how easy is that?? Even when I double the recipe, it doesn’t seem to last long! These are the ingredients you will need to prepare Broccoli Slaw That Works. If the bag of Broccoli Slaw you find is 12 ounces instead of 10 ounces, not to worry. It will work just fine. I use roasted, salted sunflower seeds, but unsalted ones are ok. Do not use raw ones, as they tend to get too chewy. I get the sunflower seeds from the bins in the bulk section of the grocery. It is much cheaper than buying them packaged, and they are usually much fresher. I use them in snack mixes, salads, protein bars, granola and other recipes. They’re also great for snacks. I am in love with these OXO measuring cups! I love the way these measuring cups are marked on the inside of the cup. You don’t have to get down on your knees to see if you have measured correctly! I have 4 different sizes of these measuring cups – the 4 cup, the 2 cup, the 1 cup and the 4 tablespoon size. I must say, the 4 tablespoon size is the one I use most often. I have 6 of them, and when I’m preparing several recipes, all 6 of them might be in use measuring tablespoon amounts of liquids. 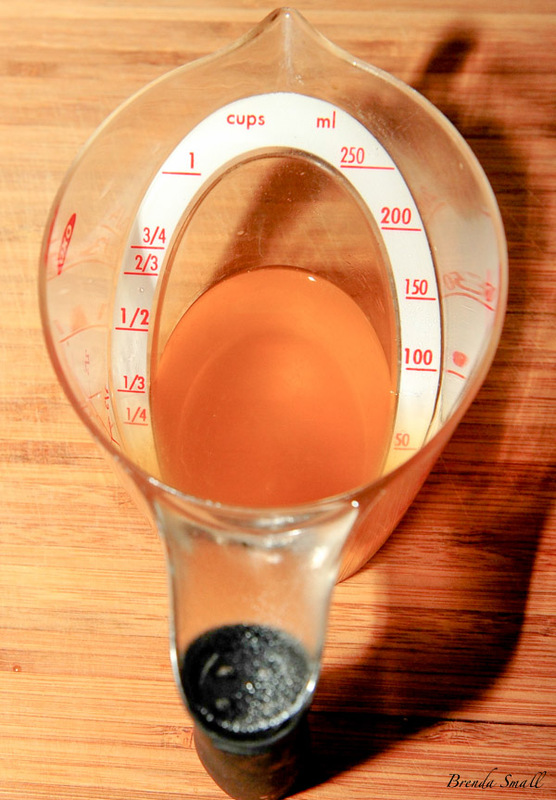 I no longer use tablespoon size measuring spoons to measure liquid ingredients. This is a Tupperware shaker, and it is one of my favorite kitchen tools. I would not want to have to cook without it! 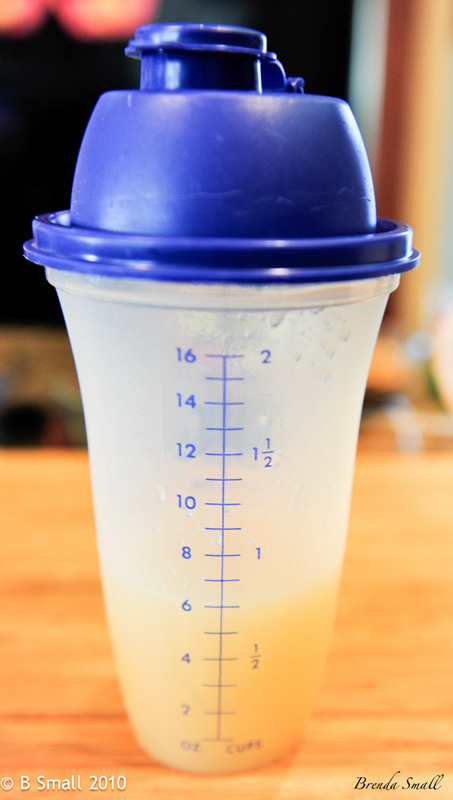 I have 4 of these shakers, and they are very “high-mileage”! They are great for any liquid that needs a good shake…like salad dressings, marinades and some drinks. 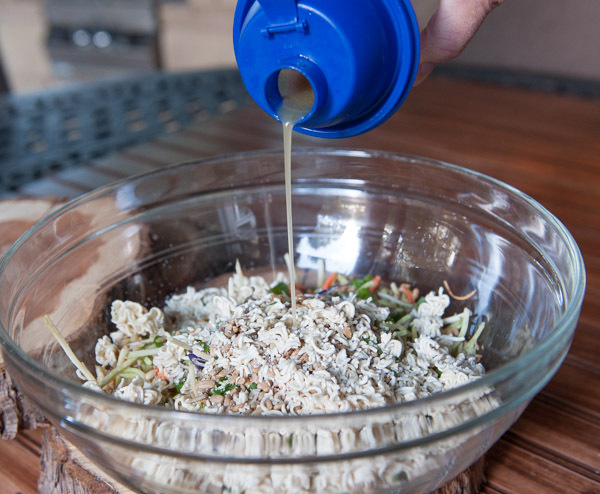 Just put all of the ingredients in, shake (the lid is very tight fitting) and walla, salad dressing prepared in a single container that you can also serve and store in. It doesn’t get any easier than that!! Most of my knives are Wusthof. This Santoku is one of my very favorite knives that Wusthof makes. 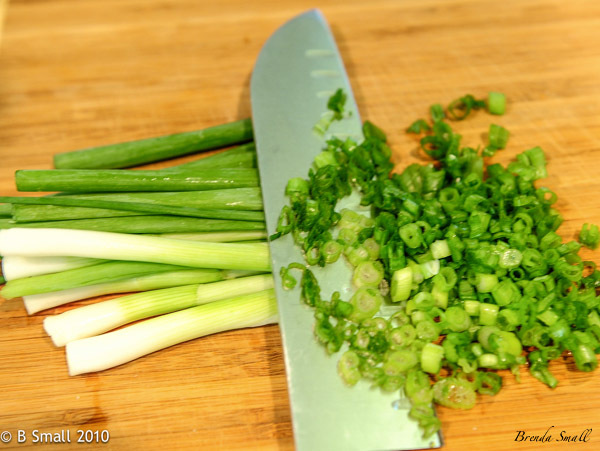 ALso, this is the size the green onion slices should be. I like the Santoku knife, as I feel like I have a lot more control over it that I do over the Chef knife. It doesn’t rock as much as my Chef knife does. I love it for slicing, cutting and dicing. Hit with the heel of your hand to break up the Ramen noodles. 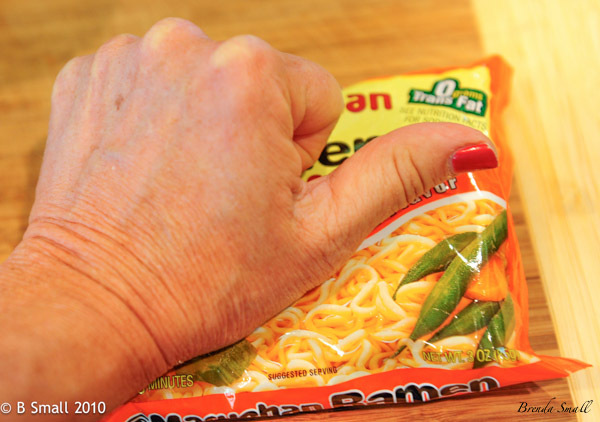 To break-up the Ramen noodles: Before opening the noodle package, place the seam side down on a hard surface. With the heel of your hand, hit on the package just hard enough to break up the noodles. (Be careful not to bruise your hand… from the voice of experience!) You don’t need to crush the noodles, simply break them apart. 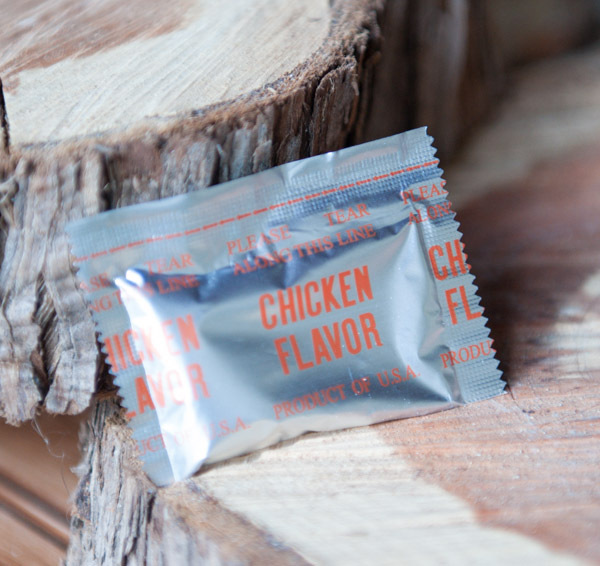 This is the seasoning packet that comes inside the Ramen noodle package. Add the seasoning packet to the slaw dressing. This is with all of the ingredients, except the dressing, before tossing. As for the container, it’s also Tupperware. This is the Tupperware marinating container. It has ridges in the bottom and the top to allow marinades to get under the food. They also make a smaller size marinating container. I have several of both sizes, and I use them often to marinate, to toss salads and slaws and for storage. This is a single recipe of the Broccoli Slaw That Works. Not something I often make, but for some reason, I only had one package of Broccoli Slaw. In a shaker or jar with a tight-fitting lid, shake the oil, vinegar, sugar and the seasoning packet from the Ramen Noodles until thoroughly combined. You could also simply whisk the ingredients together in a small mixing bowl. Set aside. 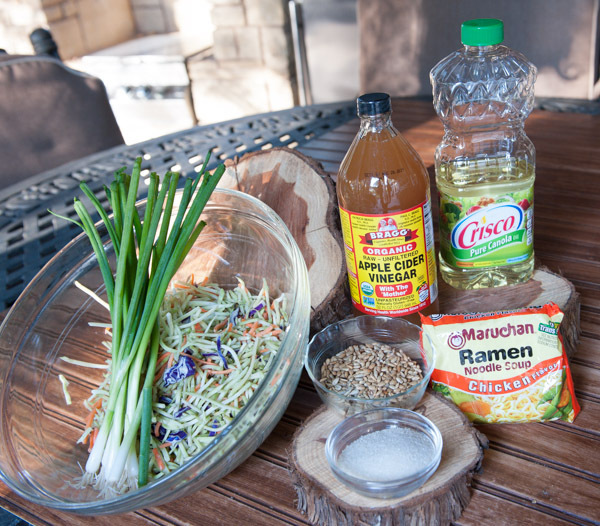 In a large mixing or salad bowl, toss together the broccoli slaw, green onions, sunflower seeds and Ramen noodles. Toss in the dressing to thoroughly coat the slaw ingredients.